I made these wonderfully cute little cookies the other day. 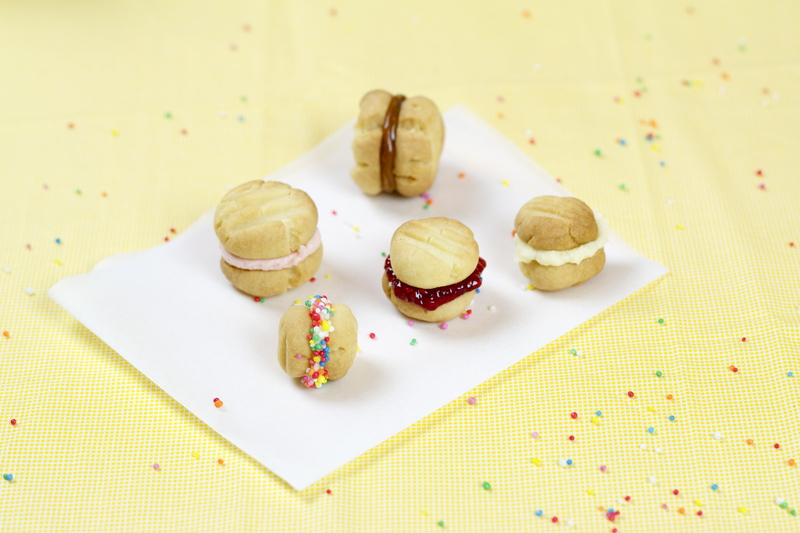 Yo-Yos or Melting Moments as they’re also called, is a classic Aussie biscuit. 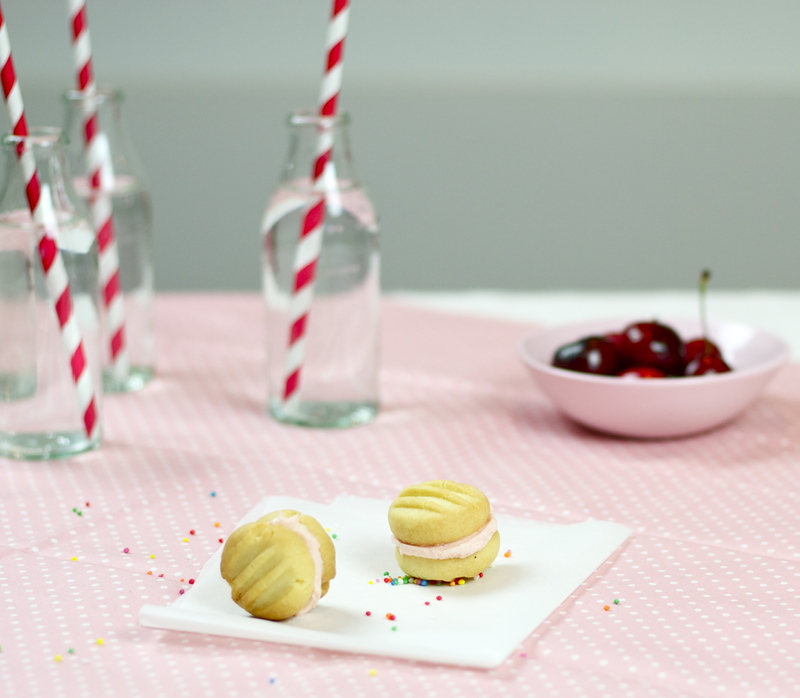 But I have to say I prefer to call them Yo-Yos over Melting Moments. Sounds pretty freaking cheesy. Being pink and tiny, and on top of it all being called “a melting moment”. I think it’s just to much to handle, even for a cookie. Nah I’m sorry, got to draw the line somewhere.. So I went slightly overboard and made 5 different kinds. Mostly cause I had homemade raspberry jam and Dulce de leche in my fridge, and wanted to show off. Preheat the oven to 160°C. Line 2 baking trays with non-stick baking paper. In a bowl, beat butter, vanilla and icing sugar until light and fluffy using an electric mixer. Sift flours over the butter mixture and beat on a low speed until soft dough forms. Roll heaped teaspoonfuls of mixture into small balls and place on the tray. 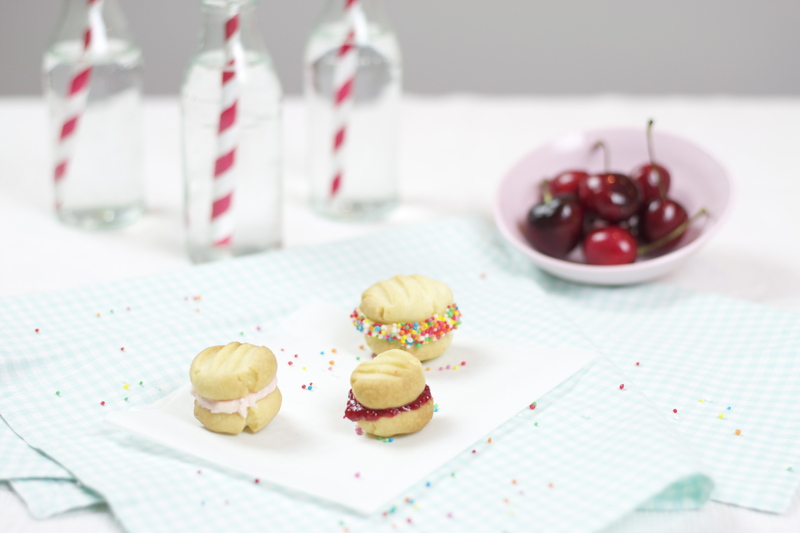 Using a fork dipped in flour, lightly flatten each biscuit until about 1 cm thick. Bake for about 15 minutes or until firm. Let cool on trays or transfer to a wire rack. For the filling. Using an electric mixer, beat butter until light and fluffy, then add the icing sugar and beat until incorporated. Depending on if you want to make just the passion fruit one or the colored vanilla one. to make just one kind, mix with either the pulp from 2 passion fruits or vanilla essence to taste and some food coloring. If you want to make both kinds, just divide the filling in half and add the pulp from one passion fruit and some coloring and vanilla to the other one. 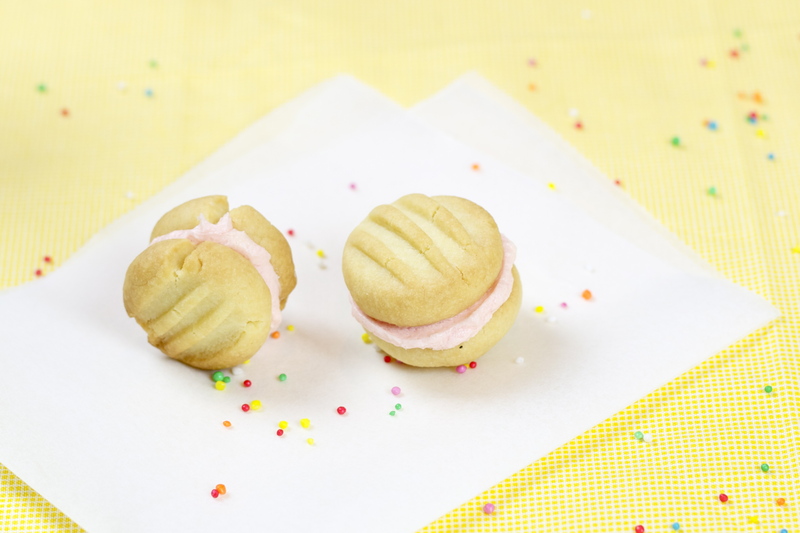 Spread the flat side of 1 biscuit with 1 teaspoon of filling. Top with another biscuit. Repeat with remaining biscuits and fillings. Roll in sprinkles if you want the extra festive look. *You can either buy it from Latin American grocers. Or you can make your own, by simmering an unopened can of condensed milk (sweetened) for about 3.5-4 hours. It’s important that is doesn’t boil to hard (should be simmering) and that it is covered with water during the whole cooking time. So you might have to add water while it’s cooking. If all the water evaporates and the pot goes dry, the can might explode. And we don’t would that. Even if it would be kind of exciting I guess. And your kitchen would be covered in the most delicious caramel sauce ever known to mankind. Thanks, I really recommend the dulce de leche ones. 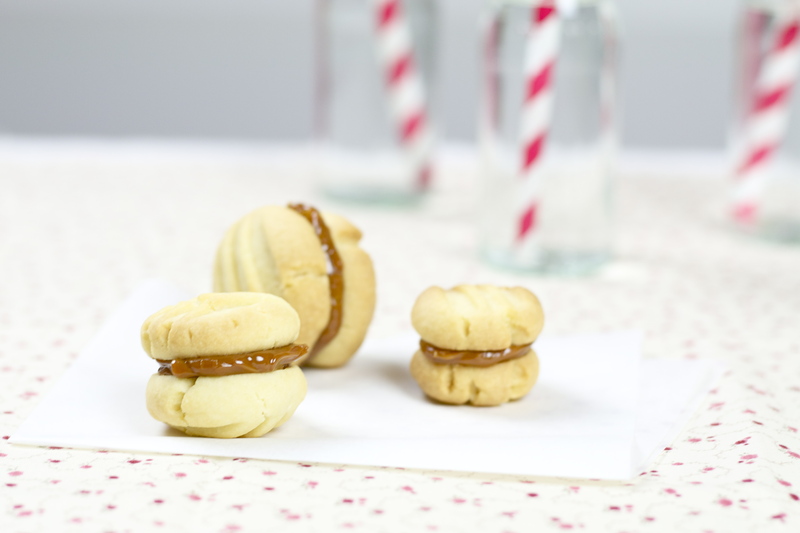 Love dulce de leche! I was ten the first time I made dulce de leche … of course the pan boiled dry, ten-year-olds don’t have the patience to watch a boiling pot for three hours! When my parents moved out of that house fifteen years later they were still finding bits of sweet caramel behind cabinets and in obscure places all over the kitchen. Great simple recipe, I’m definitely going to try this. Thank you for visiting Shelley-belly Blogs, your visit led me here.